I recently read Marshal Ulrich’s book ‘Running on Empty’ (http://marshallulrich.com/). The man is an endurance machine and I appreciated the introspection he included. Marshall also had all of his toe nails surgically removed because he was tired of them getting infected and falling off. 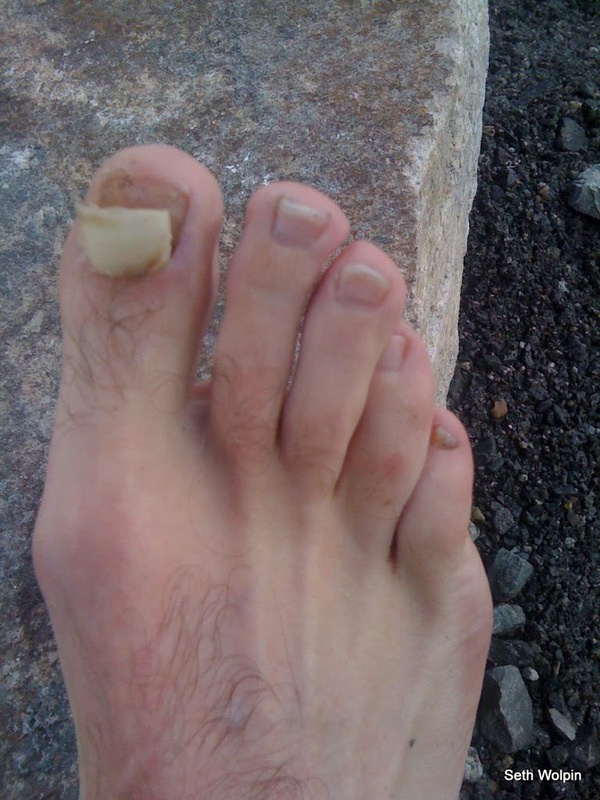 Reading about this reminded me of my unfinished post about losing a big toe nail on Everest. 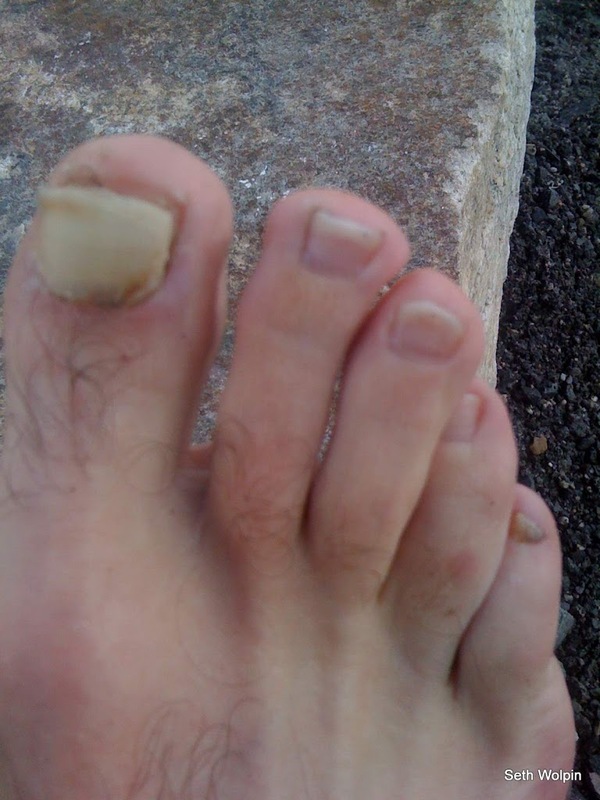 Not liking unfinished business and having a perverse interest (shared with many other runners I expect) in toe nail loss (I was once really proud of being able to say I had lost 6 in one year) – here goes…. 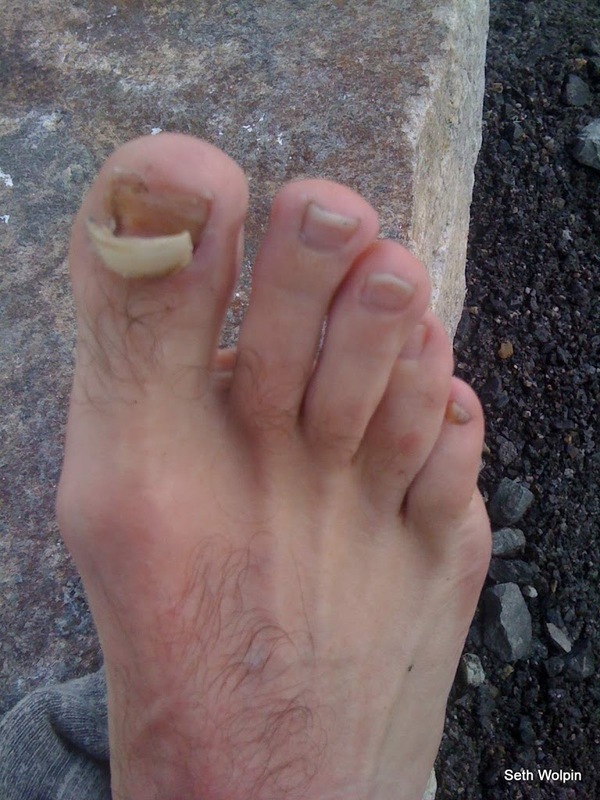 Losing a toe nail to an endurance sport represents bad footwear or pushing the edge IMHO. Having both bad shoes/boots and sometimes running/descending too much, I like to pretend it is more the latter and look forward to my next toe nail departure. By the time they come off, they are often dead and don’t hurt. And they usually represent surviving a suffer-fest. 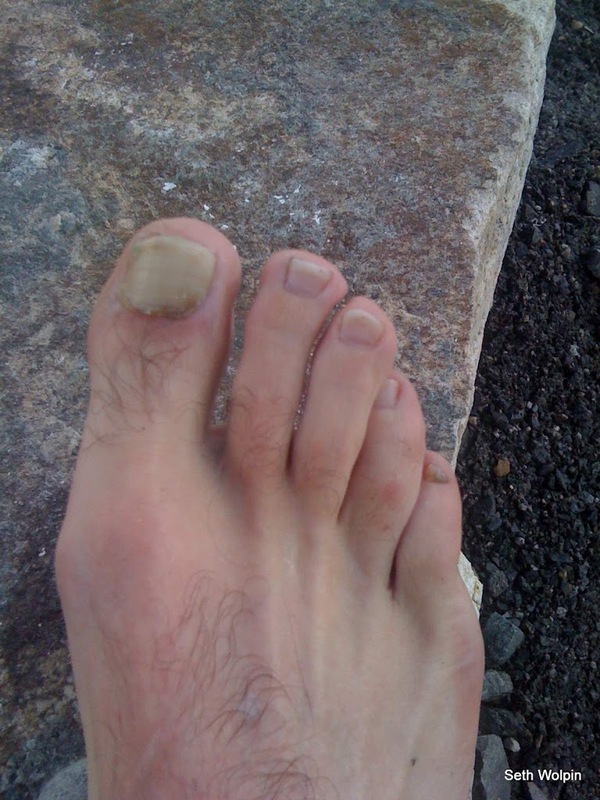 Disclaimer: Before you read any further, stop if you are squimish about lost toe nails. Textual descriptions and visual depictions. This article does not replace a conversation with your healthcare provider should you have your own personal toe nail issue, blah blah blah. And this post is really is gross. Damn gross. The 14 year old in me wrote it. Just with slightly improved grammar. You have been warned…some paragraph breaks here to protect the innocent. Before Everest, in late March, we did Island Peak as a conditioner. A little over 6,000m. The trip from Advance Base Camp (ABC) and back was 17 hours, a lot of it with Damai fixing the head wall. Hard work! I don’t know what the vertical feet were descending back to advanced base camp (maybe 3k? ), but I could feel my toes getting a bit jammed. The next day, descending down to base camp and several hours out to Chukhung, my big right one hurt even more. After a night of rest in Chukhung, we headed off to Everest Base Camp (EBC). 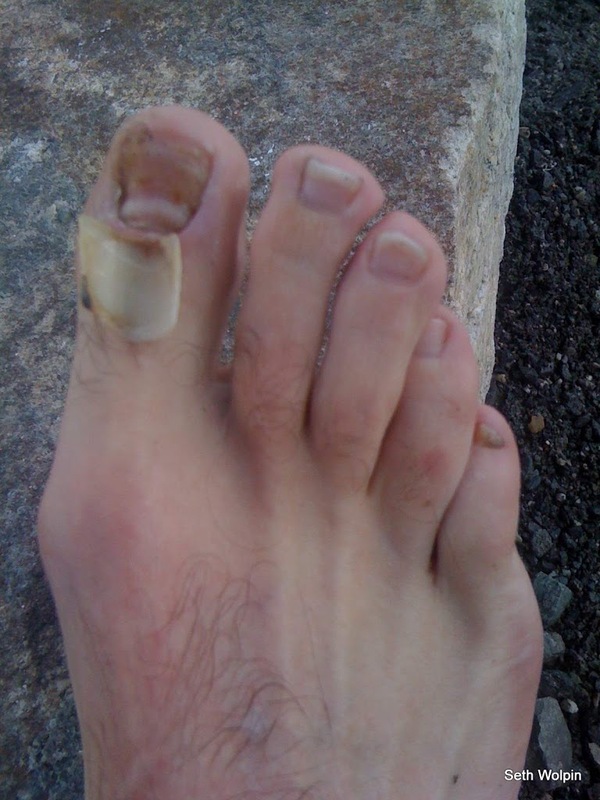 My toe was pretty pissed off, even though a lot was uphill walking and the pressure was off it most of the time. But it was still noticable during the two day walk to EBC; once there, I worried that we might start climbing soon and it could get even MORE pissed off during the climb. In early April, I visited the new docs at the Everest ER tent. I think I was their second patient and was happy to eventually become friends with all (Luanna, Jennifer, Rachel, and Ashish). A lot of discussion ensued about trepenating the toe nail (basically putting a hole in it to relieve pressure) or cutting into the tissue above the two. I lobbied for the trepenation b/c cuts to flesh were healing super slowly at that altitude. Plus, none of us could figure out how to open the child-proof scalpel. There was also talk of removing the whole toe nail along with ‘some adhesions’ but that didn’t sound fun. The consensus was that if we could relieve the pressure and avoid infection – the toe nail would eventually die and fall off, but it would be a good splint until then. No arguments from me. In my Wilderness First Responder class we were taught to heat up a paper clip and gently press it against the toe nail to release pressure. HRA had a new battery-operated gizmo and I think Dr. Jennifer had the first stab. A lot of junk came out.All of us were impressed. Difficult to see here. I spent too much time imagining having my summit attempt thwarted by an errant toe nail. But slowly I forgot, I also stopped changing my socks and inspecting things as much. Toe cheese beats out yak cheese. Nothing but the truth here folks. Fast forward about a month. I’m getting ready for my summit push. In that rare change of socks, the toe nail lifts almost completely off. What about my splint? I needed that splint, not a soft nail bed getting pounded on everest. I grab some medical tap and wrap that sucker back on. It does its job perfectly. Two days after summiting and getting back to base camp – one should have at least washed their feet. So I, ahem, intentionally punched through some ice at base camp and soak/clean my right foot in the icy water. It’s cold, the left will have to wait. I hobble back to my tent and pull off the wet sock I have been wearing since Camp II. The first thing I notice is how clean my right foot is, then I notice how the sock has mostly pulled the medical tape off the big toe and that the sucker/splint/toe nail is no longer meant to be part of my journey. These are low resolution pics – from my phone – but I hope you like the sequencing..
Ewww! I’ve lost toe nails too, including the big ones. They’ve never been the same. I’ve heard of a few URers doing surgical removal.